In the first post about Head, Shoulders, Neck and your Voice, we looked at a few ways to move the neck into a more neutral place to help eliminate “Piano Head”, where your head is thrust forward, adding so much weight to your neck. In this post, I’ll share a few simple (though they may be very sensational!) 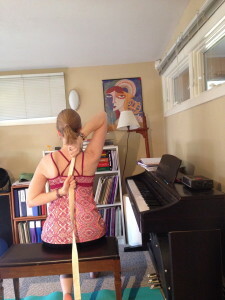 stretches to help move your shoulders out of internal rotation, the place where they are most of the time thanks to playing piano, typing, carrying things and driving. Hold each of these for around 3-5 breaths, or longer if it feels comfortable. Also, I’m not a doctor, so consult with your physician if you have health concerns before beginning any exercise program. The first thing you can do is roll up a small hand-towel and lie with it behind your neck. Make it big enough so you feel the support, but not so big that it hurts. This encourages your neck to be in its natural curved state. 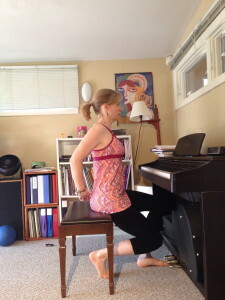 Next, sitting appropriately (with your pelvis in neutral), clasp your hands behind your back. Open the palms away from each other and bend your elbows slightly. 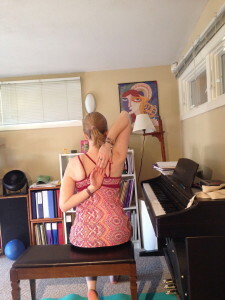 Then, gently squeeze your shoulder blades together thinking about spreading across your collarbones. Keep your head in neutral. 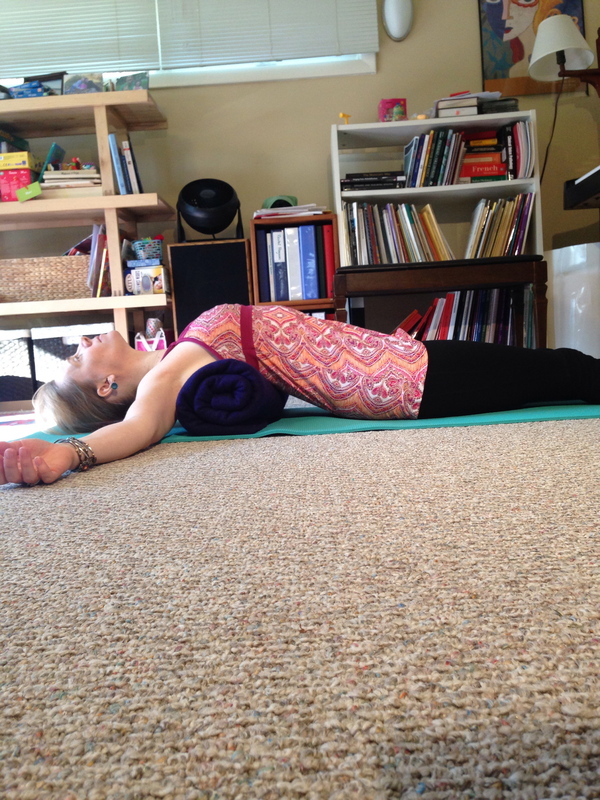 While sitting you can do the arm portion of Gomukasana (Cow Face Pose…don’t ask). Move one arm behind the back and try to bring the back of the hand between the shoulder blades. 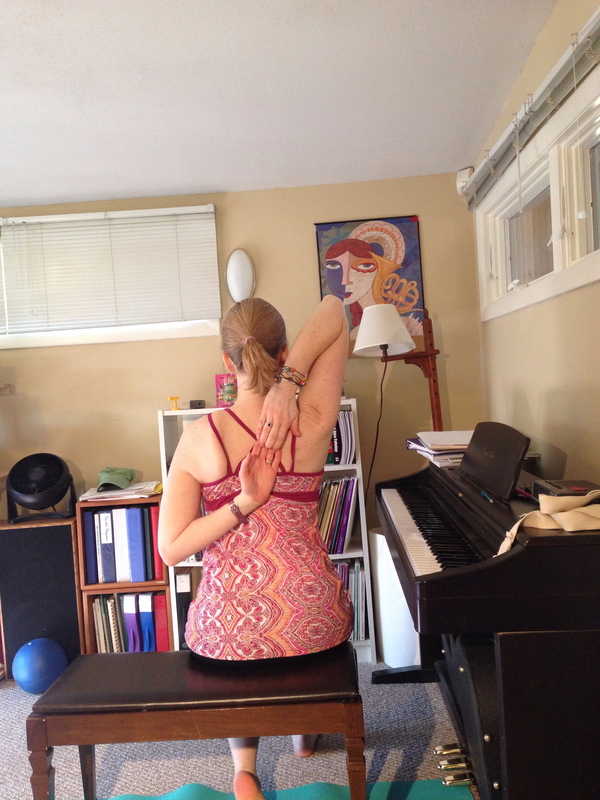 Extend the other arm up and reach back to clasp the fingers of the hand between your shoulder blades. 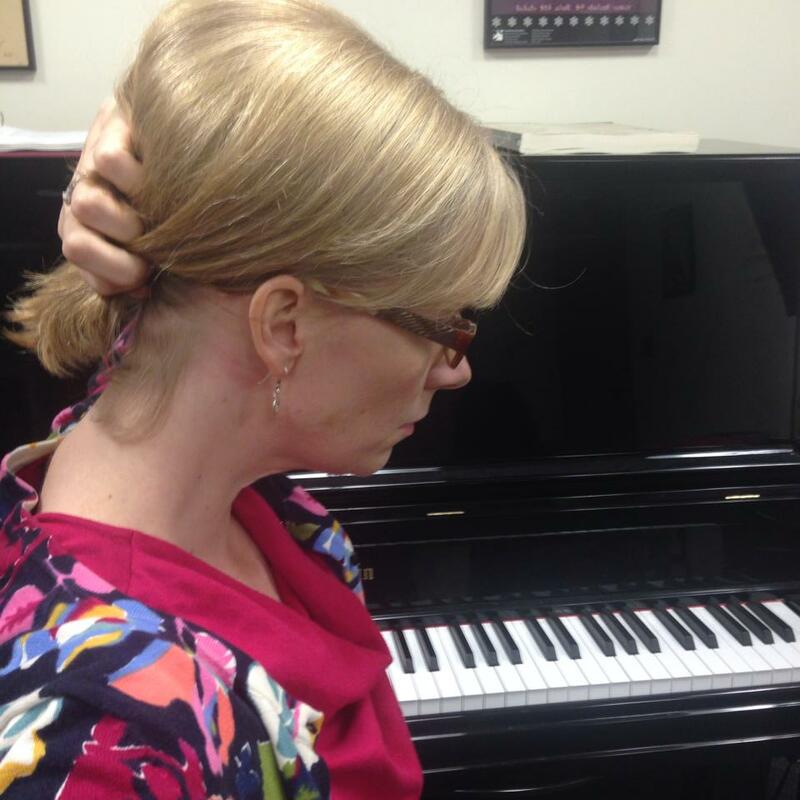 If your fingers don’t easily meet, use a strap to act as an extension of your arms. 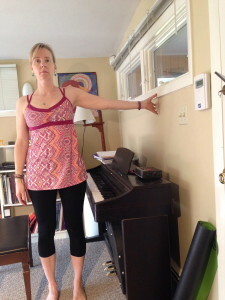 Stand with your feet hip width distance apart, feet pointing straight forward and extend your arm to the wall. Touch just the finger tips and tip of the thumb against the wall at shoulder height. The thumb should be pointing up. This one may tingle all the way down into your fingers. That’s because we are compressing a nerve a bit. Lastly, you can lie over a bolster placed behind your heart center. Have your shoulder blades draping down the far side, arms open at shoulder height – you can play with moving the arms around the vary the sensation. 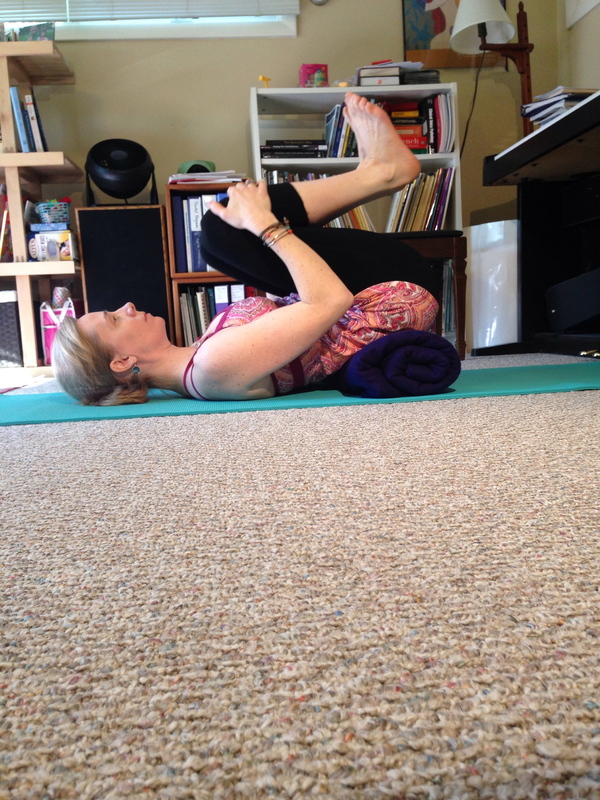 To come out of the pose, bring your feet to the floor and pick your hips up. 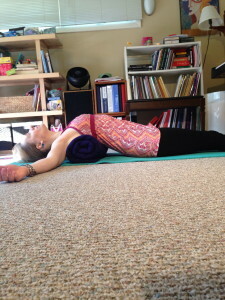 Shift the bolster to be under your sacrum, rest back down on it and hug the knees into your chest. Physically, you need your larynx to be aligned just right for your breath to flow optimally and your voice to sound at its potential. However, what do you you a lot every day? Type on the computer, drive, play piano or other instruments, hold children, carry heavy bags, slump in a chair…any of those sound familiar? Each of those activities pulls your head in front of your shoulder line, adding weight to your neck and pulls your arms out in front of you, putting your arms and shoulders into internal rotation, pulling your shoulder blades away from your spine. OW! I’m giving a bit of an extreme example, but you get the point. Though you are primarily concerned about your voice, the long term effects of this position are a bit grim. This misalignment is linked to impingement of nerves in the neck, migraines, eye tension, breathing problems, endocrine issues as well as rotator cuff injuries. Your situation might not be at a point where you feel pain in your neck and shoulders, but if you don’t address it now, it will get there. If you aren’t sure if your upper chest is tight, try palpating just below your collarbone from your sternum out toward your shoulder and see if you feel some pain. That’s one of your pec muscles – in an extreme situation, you might feel the pain radiate through to the muscles around your shoulders in the back. Then, extend your arms out wide and notice what you feel down your inner arm. You will feel how tight the inner arm is. Honestly, I was shocked when I did both of these things at just how much sensation (sounds nicer than pain, right?) I felt across the top of my chest and all the way down my inner arm and into my fingers. I often have neck pain. The combination of a water skiing accident as a child and being rearended in my twenties with my head turned over my left shoulder left me with my 2nd cervical vertebrae out of alignment. My neck muscles spasmed after giving birth to my second and in the last two years the pain would sometimes get pretty intense, feeling like my head was in a vice and all I wanted to do was close my eyes and lie down. My vocal symptoms included not being able to sing the really, really high notes that I had been easy before. Fortunately, I started exploring things through my yoga practice and have managed to keep the pain and tension at a minimum, re-finding some high notes and making my life much, much better. 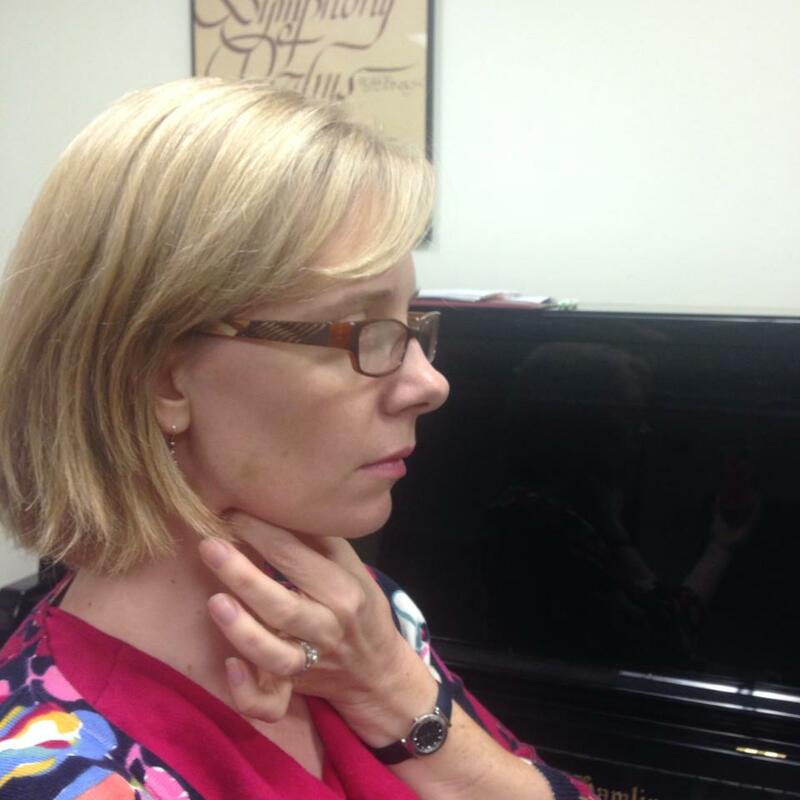 Here are a few things you can do and your voice, neck and shoulders will thank you for it. First, find your hyoid bone in your neck and imagine it moving back and slightly up, pulling your neck and head back with it. 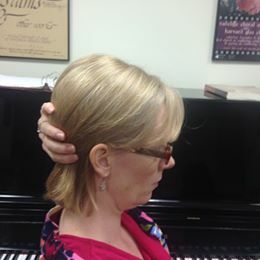 Then, cup the back of your head with your hand and press the head back into your hand. 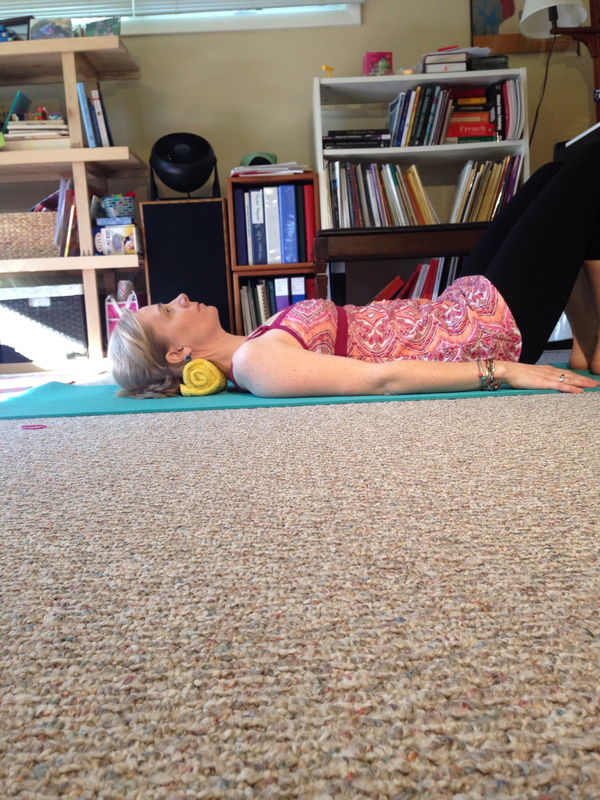 This will get you on the road to moving your head and neck back into alignment. It will probably feel pretty foreign at first and you’ll have to develop a sense of how it feels when it is in the right place so you can be aware of when it isn’t. Taking it to the next level to really create a long term remedy involves some great yoga-based stretches that I’ll share in another post. 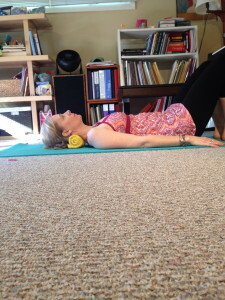 Together, these go a long way to undoing tension and pain in the neck to help your voice function at its best! Sign up and get a FREE class focused on your shoulders!